Many people have heard about the school-to-prison pipeline — how harsh school discipline policies funnel kids into the criminal justice system. Last month, the Children’s Defense Fund issued its 2012 report on the State of America’s Children, whose data show how black children move through the Cradle-to-Prison Pipeline at higher rates than any other group. That’s just part of the story. The report walks you through a child’s life, who is born into poverty (black children are nearly four times as likely as white children to live in extreme poverty) and into a family structure with limited support (51 percent live with only one mother). When that family structure breaks down or fails them, the systems step in (black children are more than twice as likely as white children to be in foster care) or the systems take away (black children are over six times as likely as white children to have a parent in prison). For many, the struggle to live and thrive begins in the womb (black babies were more than twice as likely as white babies to be born at low birth weight and to mothers who received late or no prenatal care). Having survived birth, the developmental disparities start early: at nine months, black babies score lower on measures of cognitive development than white babies and at 24 months, the gap in cognitive developmenthas more than tripled between black babies and white babies. On average, black children arrive their first day of school with lower levels of school readiness than white children. (1) Societal inequality that helps drive social determinants of health, (2) A worse developmental context for some children from conception on, (3) How behavioral and mental health shape adolescent and adult life and contribute heavily to early mortality, and (4) A contradictory health care system that burdens some through error and over-treatment and does not reach those who really need the preventive and primary care that would help address factors 1, 2, and 3. And he provides more details on why. In the most recent — and extremely captivating — episode of “This American Life”, “Back to School”, host Ira Glass features Paul Tough’s new book How Children Succeed, which examines emerging theories about what and how to teach children, from birth through high school. Paul Tough discusses how “non-cognitive skills” — qualities like tenacity, resilience, impulse control — are being viewed as increasingly vital in education, and Ira speaks with economist James Heckman, who’s been at the center of this research and this shift. San Francisco Pediatrician Nadine Burke Harris weighs in to discuss studies that show how poverty-related stress can affect brain development, and inhibit the development of non-cognitive skills. We also hear from a teenager named Kewauna Lerma, who talks about her struggles with some of the skills discussed, like restraint and impulse control. To dismantle the cradle-to-prison pipeline, to improve our health care system so that the U.S. moves up from 37th out of 191 countries in average life expectancy, and to make sure our children obtain the education they need to be successful in their lives, ALL of our systems — education, health, courts, prisons, business, etc. — need to integrate trauma-informed practices…for everyone. There’s a broader way of looking at this. One person described this effort of making all of our systems trauma-informed as a social movement. That’s partly because it addresses a big missing piece of human rights — children’s rights. Not too long ago, 90 percent of the world’s people lived in slavery, and for centuries, people thought that’s the way life was supposed to be. Then owning a man became not only illegal, but unthinkable. More recently, most of the world’s women were owned by their fathers, husbands or brothers, and people thought that’s the way life was supposed to be. Then, in most countries, woman became free, too. Unfortunately, women in many countries still don’t have property and other rights, including the right to be free from being physically abused by their husbands. There are many knots to unravel in undoing ownership. In most of the world, children are still regarded as the property of their parents or the state. What happens when children are not able to be owned? For one thing, physical and verbal abuse become unthinkable. If you restrain an adult male and hit him across the buttocks, that’s assault. If you scream invectives at a man in public, you are regarded as having issues with anger management. But there’s more to freedom than the freedom from assault. If you’re free, you’re accorded the same rights as other people who are free. In many countries, that includes health care and good education. Every second and a half during the school year a public school student receives an out-of-school suspension. Every 8 seconds during the school year a public high school student drops out. Every 17 seconds a child is arrested. Every 19 seconds a baby is born to an unmarried mother. Every 29 seconds a baby is born into poverty. Every 30 seconds during the school year a public school student is corporally punished. Every 47 seconds a child is abused or neglected. Every 67 seconds a baby is born without health insurance. Every 85 seconds a baby is born to a teen mother. Every 3 minutes a child is arrested for a drug offense. 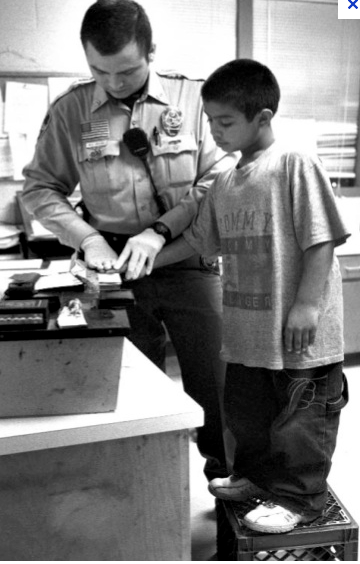 Every 6 minutes a child is arrested for a violent offense. Every 21 minutes a baby dies before his or her first birthday. Every hour and a half a child or teen dies from an accident. Every 5-and-a-half hours a child is killed by abuse or neglect. Every 8 hours a child or teen commits suicide. Every 10 hours a baby’s mother dies due to complications from pregnancy or childbirth. Having all of our systems integrate trauma-informed practices addresses children’s rights. But this approach affects much more than children’s rights. We’re entering a time when the recent scientific understanding of how we humans develop and how we respond to our social and emotional environments shows us that compassionate systems that care about and support people rather than punish, shame or blame them result in healthier, happier people. So, treating children differently also means treating their parents differently, too. Right now, we live in a world where punishment, shame, and blame are normal. Most people think that’s the way life should be. But we’re learning that punishment, shame and blame traumatize people. Furthermore, those approach don’t achieve the results we’re looking for. Instituting “nice” — compassionate, problem-solving, solution-oriented practices — gets better results and costs less. It doesn’t matter what your politics are, that can work for everybody. I appreciate your advocacy for our nations children. A wonderful article that looks through the lens of protecting our children and addressing issues early on, instead of paying the high price of no intervention. Thank you, Jim. Very kind of you. Jane, you’ve hit the nail on the head with this one! We are doing the community mobilization work because of children’s rights- a perfect way to explain it that is easy, direct, straight forward and inarguably the essence of the story. Thanks, you capture this work like no one else! Thanks for your kind words, Teri. The Children’s Resilience Initiative that you’ve got going in Walla Walla, WA, is a great example of putting these thoughts into practice. And your work inspired Jim Sporleder, who made the comment above, to change his approach to school discipline, from punitive to compassionate, and this has already made a big difference the lives of many kids.